The stock market like a roller coaster rockets higher one day only to plunge lower the next. That is what this week has been like, a roller coaster ride. Starting the week with a Monday late session 1175 point plunge, bouncing Tuesday by 570 points to 24,912. Taking a breather on Wednesday by closing steady at 24,893, then plunged once more yesterday (Thursday) by over 1000 points, closing at 23,860, with the Dow now down over 10% from its 2018 high. My longstanding view is that January's stock market rally was unsustainable and that if the market did not come to its senses soon could even be heading for a 1929 moment, where it not only crashes, but crashes and burns into a 90% wipeout bear market. Whilst my forecast expectations as of the start of the year were for the Dow to target a correction to 23,000. And so by the start of February the stock market started to correct which prompted my following update that reiterated my expectations for the Dow to target 23,000 which despite this weeks plunge remains pending. We'll you were WARNED! 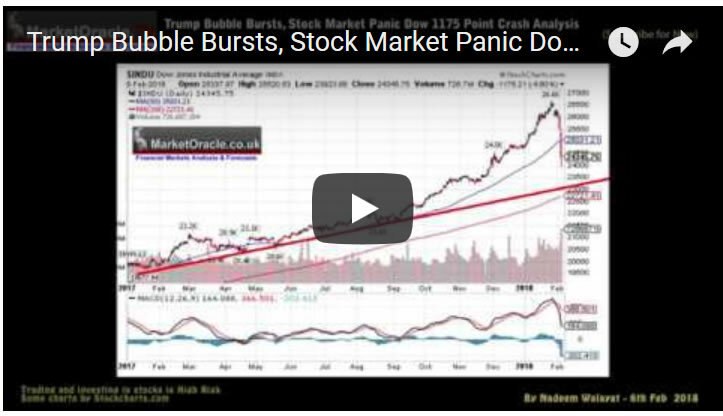 As my opening analysis of the year pointed out that for the stocks bull market to remain healthy then IT MUST CORRECT, and the worst thing that the stock market could do was to continue on rallying in its increasingly exponential trend towards a mania bubble peak which would ultimately replicate what was happening to Bitcoin at the time in the stock market indices, and thus my conclusion was that a rational market would seek to correct it's already overbought state by trending from the then near 25k level down to 23,000 over the next couple of months or so. So What is Likely to Happen Next ? Well we are likely to continue to see wild roller coaster swings, up one day and down the next with the trend trajectory remaining towards my target of 23,000, and as yesterday was a strong down day, then today (Friday) should be a strong up day for the Dow at least. As for what happens after 23,000 is achieved, well for that I will need to fully evaluate the damage done to the market, not from the February's crash but by Januarys rally, whether the nose dive to 23k is enough to fix a broken stock market or whether the market needs to go much, much lower. So ensure you are subscribed to my always free newsletter and youtube channel for my forthcoming in-depth analysis and detailed stock market trend forecast.